Kaladlit Oklluktualliait [Greenland Legends], Godthaab (1859-1863). © The British Library Board. George Beste, A True Discourse of the Late Voyages of Discouerie, for the Finding of a Passage to Cathaya, by the Northweast, vnder the Conduct of Martin Frobisher Generall. London : Henry Bynneman, 1578. © The British Library Board. The Arctic has long held us in thrall, from the classical legends of Ultima Thule – “six days’ sail north of Britain … no longer any proper land nor sea nor air, but a sort of mixture of all three of the consistency of a jellyfish in which one can neither walk nor sail”, according to Pytheas – to our more immediate modern concerns of global warming. The new exhibition, curated by Philip Hatfield from the BL’s Canadian Collections and Tom Harper from the Map Library, tells the long story of European (and especially British) engagement – and in particular the long search for a transformational trading route to the riches of the East – the North-West Passage. It has all that I like in an exhibition. Lots of books and maps, obviously – but also a clear and compact narrative line, a sturdy chronological structure, lots of things I didn’t know or had never thought of – and lots that I’m still thinking about a week later. 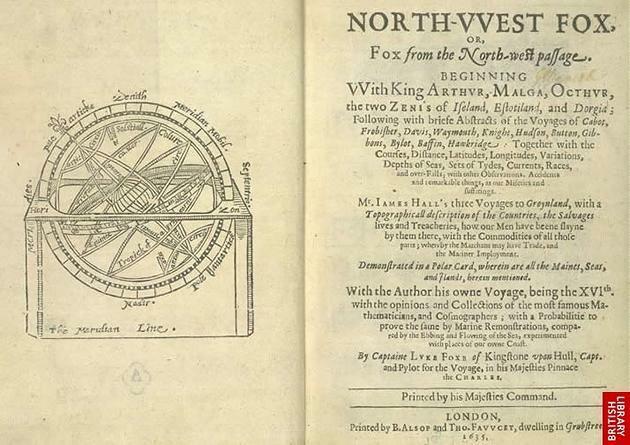 Luke Fox, North-West Fox; or, Fox from the North-West Passage. London : B. Alsop and Tho. Fawcet, 1635. © The British Library Board. The first theme is of the earliest English involvement – Frobisher and the Elizabethans – the tons of fool’s gold brought back (assayed by Humphrey Cole incidentally, who turned up here on the blog only a few weeks ago). The contemporary account published by Henry Bynneman contains just about the earliest maps found in any English account of a voyage of exploration. 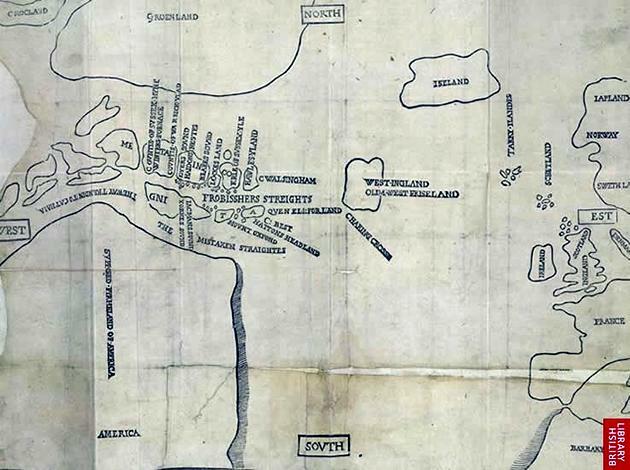 Not that such maps were of any great utility to these earliest polar explorers: Luke ‘North-West’ Fox (someone I rather missed in the exhibition at this point – likewise Baffin) preferred to do without. No time for study on such a voyage and in a crisis it was plainly too late for a captain to “runne to his chest, to looke vpon his waggoner booke” – the important thing was to act and to act decisively. Fox, it has to be said, did not lose “one man or boy, nor any manner of tackling” on his own voyage to the Arctic. The English Atlas. Volume I. Containing a Description of the Places next the North-Pole; as also of Muscovy, Poland, Sweeden, Denmark, and their Several Dependances. London : Moses Pitt, 1680. © The British Library Board. The perils and dangers were many – and not necessarily just for the voyagers. 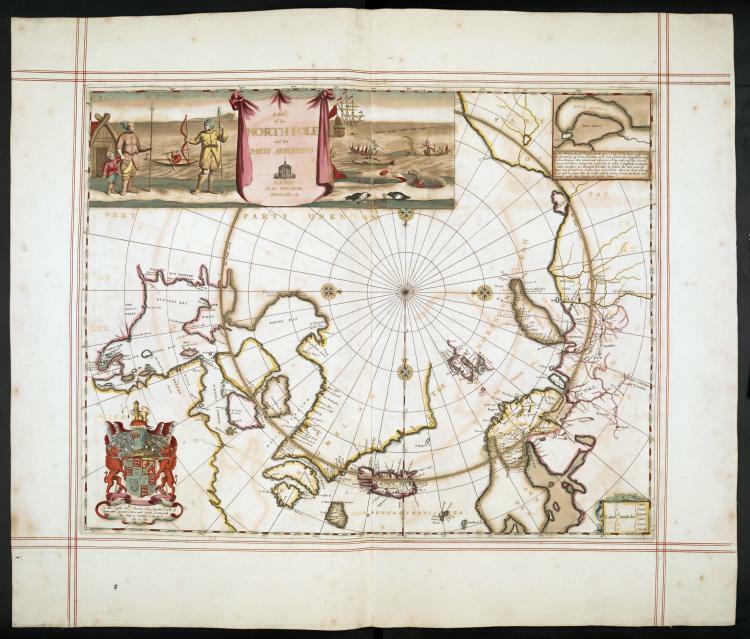 The sight of the magnificent map of the North Pole prepared for Moses Pitt’s never-completed “English Atlas” – the King’s own copy, highlighted in gold – could only bring to mind Pitt’s own fate. As William Nicholson, who wrote the text for two of the volumes of the atlas which were actually finished, put it, “My friend Moses fell into decay, and so the whole design was blasted”. The Cry of the Oppressed. Being a True and Tragical Account of the Unparallel’d Sufferings of Multitudes of Poor Imprisoned Debtors. London : For Moses Pitt, 1691. Pitt went bankrupt, was arrested for debt and consigned to the Fleet, where he wrote “The Cry of the Oppressed. Being a True and Tragical Account of the Unparallel’d Sufferings of Multitudes of Poor Imprisoned Debtors” (1691), illustrated with harrowing scenes of the fate that awaited those who ran out of money in seventeenth-century London. “He was an honest man every inch and thought of him”, was John Dunton’s lament. Journal of a Second Voyage for the Discovery of a North-West Passage from the Atlantic to the Pacific; Performed in the Years 1821-22-23, in His Majesty’s Ships Fury and Hecla, under the orders of Captain William Edward Parry. London: John Murray, 1824. © The British Library Board. The dream of a North-West Passage never entirely faded. After the defeat of Napoleon, British mastery of the seas undisputed, the quest began again in earnest with a series of official expeditions. The public expected. Mary Shelley’s “Frankenstein”, a famous narrative framed in Arctic wastes, appeared in 1818 – the same year that Captain John Ross sailed in the Isabella. Ross and Parry became household names – Cricket on the ice, anyone? – Let’s put food in tins! ­– but the great figure was Sir John Franklin. His disappearance in 1845 sparked off a sequence of some forty separate expeditions to find him – a mystery only solved in fragmented pieces. The last resting-place of his HMS Erebus was only finally discovered a few months ago. 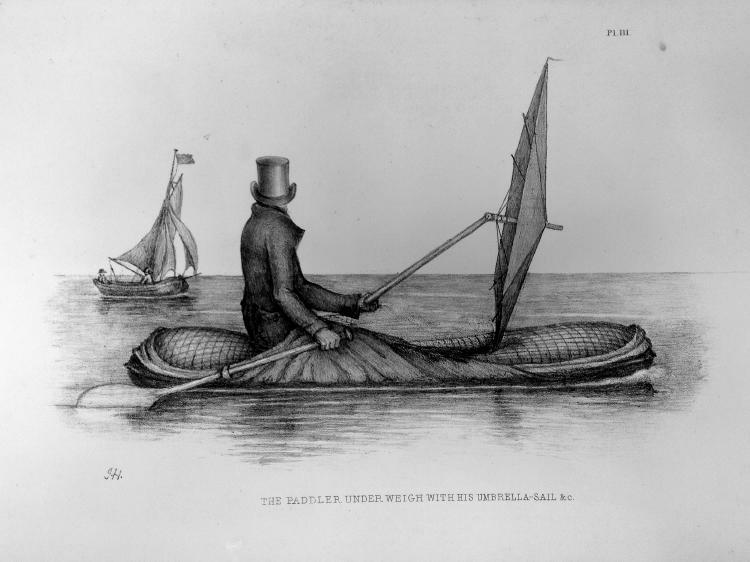 John Ross, A Voyage of Discovery, made under the Orders of the Admiralty, in His Majesty’s Ships Isabella and Alexander, for the Purpose of Exploring Baffin’s Bay, and Enquiring into the Possibility of a North-West Passage. London: John Murray, 1819. © The British Library Board. One of the searchers after Franklin, the Irishman Sir Robert John Le Mesurier McClure, court-martialled for losing his ship but given a knighthood for his achievement in almost the same breath, became the first man to traverse the passage (west to east, partly by sledge), although it was the Norwegian, Roald Amundsen, in a very different kind of expedition in 1903-1906, who could truly be said to be the first to navigate it. And Amundsen lived long enough to fly over it too. Ammassalik wooden map-sticks. From “Topografisk Atlas Grønland”. 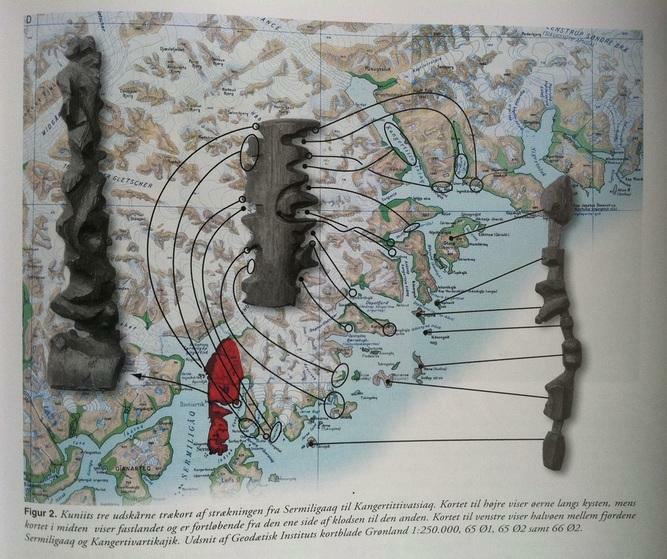 © Det Kongeglige Danske Geografiske Selskab, 2000. It was never a solely British affair and the exhibition makes due acknowledgement – there are accounts in Dutch and Russian too. Nor is the view just from one side. There are sound-recordings of Inuit oral legends – the great ships, smelt first, seen later, arriving like moving mountains in a world in which the Inuit had thought themselves alone. 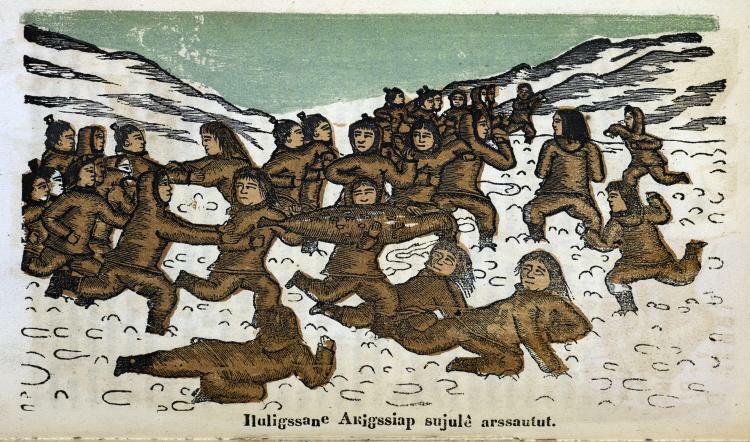 One of the most delightful things on display is a nineteenth-century picture-book of the Greenland Legends, with woodcuts by an indigenous artist. More extraordinary still are the replicas of some nineteenth-century Ammassalik wooden map-sticks – carved, three-dimensional, tactile maps of the coastlines, intended to be felt as much as looked at. The final section of the exhibition brings us up to date with the modern Arctic. Same old story, really – the quest for wealth, trade and resources. Geopolitics and competing Russian and Canadian claims based on different versions of geography (sectors versus tectonics). An unfamiliar map from 1990 giving the Inuit place-names. 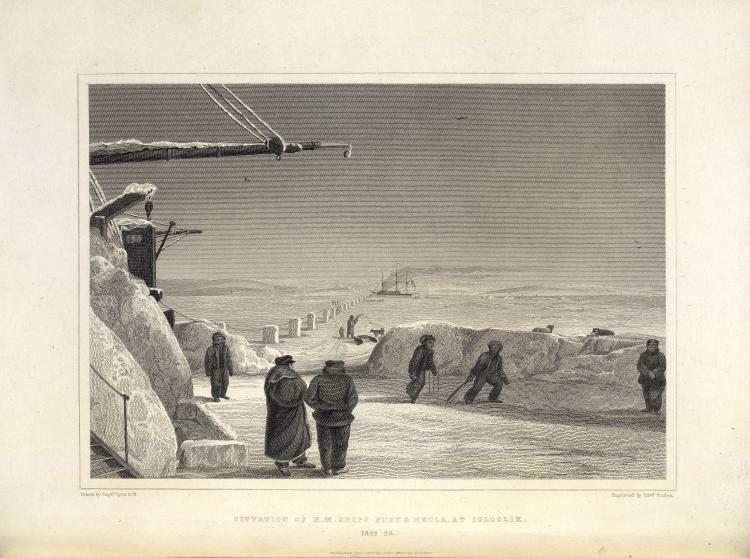 William Scoresby, An Account of the Arctic Regions : With a History and Description of the Northern Whale-Fishery. Edinburgh : for A. Constable & Co. 1820. And there has always been the matter of science. 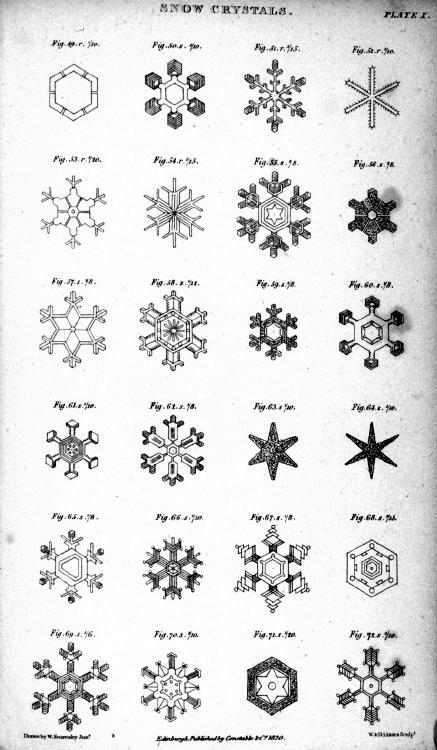 I was charmed by William Scoresby’s diagrams of snow-crystals. And salutary now to think that those iced-up channels which defeated generations of indomitable explorers are now – thanks to global warming – largely navigable. This a splendid exhibition. Thought-provoking, inspiring, full of interest and curiosity throughout, and with a haunting soundtrack of Arctic sounds from the BL archives. Don’t miss it – it’s on until next March. And here’s something else from the exhibition to think about – the cloak-boat or boat-cloak. 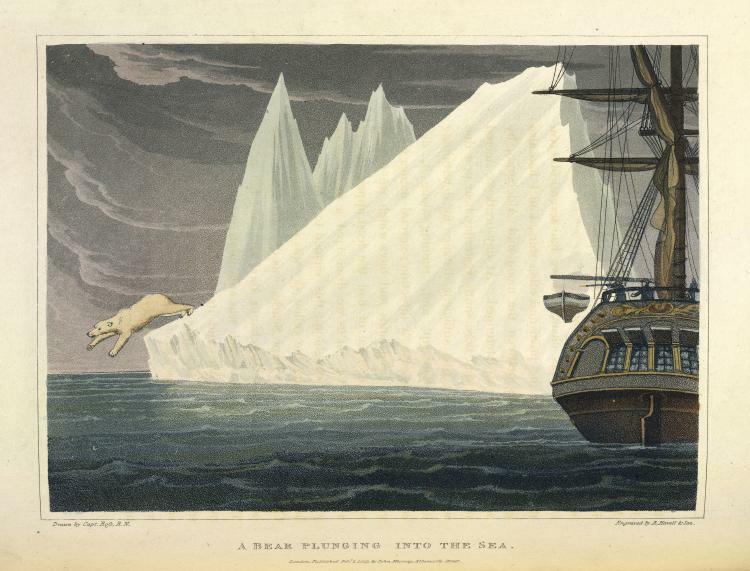 This entry was posted in Exhibitions, Libraries and tagged Arctic, British Library, Lines in the Ice. Bookmark the permalink.